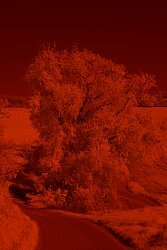 Sometimes a camera has its IR sensitivity almost completely in the red channel. The Pentax 6MP dSLRs like the *ist DS are examples for this and I will use it here. Man, that's red! The red is so strong that most cameras refuse to do a proper custom white balance reading. Not possible Already the advantage of 12bit RAW vs. 8bit JPEG shows. While some JPEG processing tools allow White Balance changes, with such a drastic colour cast, it will not work. If you prefer B&W IR, this is much less of a problem. As I said, the red is so strong that most cameras refuse to do a proper custom white balance reading. You might be lucky and be able to change the colour temperature in your camera's menu, some cameras support this. It probably will not be enough to do a full WB, but give it a try. Hm, anyone still like JPEGs? Manual Single Level adjustment means correcting the histogram for each channel individually. This gives you the best control over the colour change you are willing to accept and what noise you can tolerate by including more or less of the noisier blue and green channels. That looks kind of nice when applied to the RAW version, I think. I was made aware that some software titles do not support this. You can do this with changing the red channel's hue to blue and vice versa or use the channel mixer tool to achieve the same effect. If you use the free IrfanView, it provides an option to swap channels in RGB and CMYK mode. This can give interesting results. Not much difference anymore, but the JPEG shows problems from severe image adjustments. And this is another advantage of RAW, not only in IR but the more important the more you work your images: Even if your RAW converter does not (like mine) offer the possibility to do everything I list here, it offers exporting to TIFF and much of the posterisation and other problems happening with 8bit JPEG can be reduced by working with TIFF files. Recommendation: When doing IR, shoot RAW whenever possible. If you have to shoot JPEG, try to get the exposure as good as possible - you will have to do lots of level adjustment to get false colours, so "pushing" the JPEG should be minimzed as much as possible. (For B&W IR, this is less of a problem.) For cameras with a less extreme concentration of IR sensitivity in the red channel, you might be able to skip RAW and go with Luben Solev's Method. You may also be interested in the brief examples of how curves work for this type of images.